Early in my career running a recruiting and placement company, I accompanied a candidate on an interview for a Computer Operations job at a prestigious client that I desperately needed to impress. I thoroughly prepared and grilled him in order to help put his best foot forward. I mock-interviewed him for hours and fired out every question I could think of. I thought I had prepared, coached and honed his skills to perfection. We walked into the hiring manager’s office confidently. My candidate had an impeccable resume, pressed interview suit and an answer to every interview question I could imagine. I was feeling confident. We settled into a mahogany and leather clad conference room and the hiring manager asked my candidate his first question, “What do you know about the position?” My candidate promptly answered, “Not much.” After cursing under my breath and pulling my jaw up off my lap I sank into my seat, crawled onto the floor and slithered out the door on my belly. Needless to say he didn’t get the job. Perhaps it was my fault. I had prepared him for every difficult question I could think of but had failed to prepare him for the obvious. Now, several years and thousands of interviews later, I profess that failure to prepare adequately for an interview is a death sentence. All other things being equal, he or she who is better prepared wins. However, you cannot prepare for every question, and although this article is designed to better prepare you to succeed in an interview,realize that to succeed you must think on your feet. The candidate I escorted to the interview could have answered better than he did. I cannot teach you or anyone how to think on your feet, however, I can help by giving you killer answers to the most commonly asked interview questions. Realize there are thousands of interview questions and you cannot be prepared to answer them all. I have heard bizarre and ineffectual questions designed to see how quick you can think on your feet such as, “If you were a fruit, what would you be and why?” You can also expect situational questions that that are difficult to prepare for and are designed to see how you would react to an infinite number of situations. 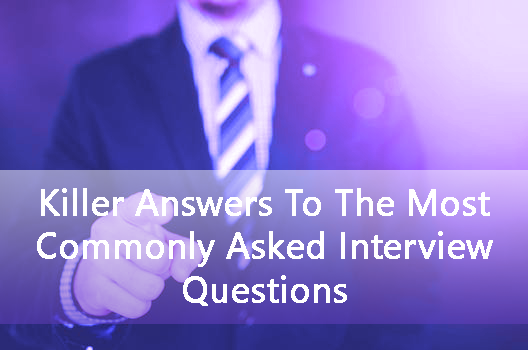 This article is designed to help you prepare to give killer answers to the most commonly asked interview questions. 2. What do you know about the job? 8. Why did you leave your previous employer(s)? 9. What are you looking for in a new job? 11. What do you want to be doing in five years? 12. What value can you lend to this company? 13. Describe the best and worst manager you’ve had? 14. Describe the most difficult problem you’ve had to solve? 15. How much are you looking to make? 1. What do you know about the company? This one is easy. The only way to blow this question is not to prepare, and if you fail to prepare, you deserve to lose the job. A quick internet search will bring you to the company’s home page and should give you all you need. Hours of research is not necessary. An understanding of the industry, the products or services a company offers, how the company differentiates itself, the corporate mission or value statement and a quick visit to the “news releases” section on the company web site to discover new product releases, strategic partnerships or other tidbits should suffice. If the company doesn’t have a news release section on their website, a Google search should give you additional insight. The killer answer to this question is to ask the interviewer a specific question about something you read on the website. This will demonstrate you have done your research (especially important if the interviewer fails to ask you what you know about the company). “I saw on your website that you have a strategic partnership with ABC company. How has that relationship helped you competitively?” Another killer response is to find out who the company executives are and to perform a Google search on their names. You may find nuggets of information about their personal interests, community involvement, recent awards they have won, and much more. “I understand your CEO was just nominated for Entrepreneur of the Year. How has his entrepreneurial spirit helped your company?” There is no need to over prepare, but asking questions that demonstrates you did your homework will distinguish you from the other candidates. 2. What do you know about the job? This is a little tougher. Often all you have seen is a brief description written in an ad. In order to find more information you can visit the employment section of the company’s website. If you are working through a recruiter he or she should have lots of detail for you.The killer answer to this question is to let the interviewer know you called the human resources department, receptionist, customer service department or other people who have the same job in the company to get the inside scoop on the duties and responsibilities. After you let them know you went the extra mile to research the position ask them to describe what the duties and responsibilities are. experience with what you learned about yourself along the way. “I was brought up in a loving but financially needy family. I learned at a young age that work gave me independence. I worked my way through high school and college and have had to work hard for everything I’ve ever achieved. After graduating from Canisius College I went to work for Xerox as a sales representative and I quickly learned that you have to learn and improve every day in order to succeed in such a competitive environment. I was fortunate to be surrounded by some of the best in the industry and it helped raise the level of my performance. I continually was ranked #1 or #2 among my teammates and would have stayed there forever if there was a chance to advance without having to leave Buffalo. I then took a promotion to become a sales manager at United Sales Associates and had to learn how to motivate others in order to succeed. Etc…” When you share a small dose of personal information and expose a bit of what defines you as an individual your openness and honesty endears you to the interviewer. Remember keep it short and to the point. An answer that lasts longer than one or two minutes may get you into trouble. 4. What are your greatest strengths? This too is easy. So easy that my killer answer is to know yourself and don’t brag. own weaknesses knows how to improve. The worst answer to this question is to say you have no weaknesses, or you can’t really think of any. Nearly as bad is to tell them something too personal or bad. The interviewer doesn’t need to know you drink a case of beer every night or like torturing small animals. However a dose of honesty will endear you to your interviewer. “I tend to bore easily. At times I can get distracted. I catch myself doing the duties that are more enjoyable instead of those that are the most important.” There is an important add-on to each of these responses. Any time you give a weakness, let the interviewer know what you are doing to overcome it. “By multitasking and putting a lot on my plate I am able to overcome my boredom. I list all my top priorities for the day in my planner and make sure I complete them no matter what. I do all my important duties in the morning before I do the enjoyable duties.” Knowing your weaknesses is the first step to top performance, correcting them is paramount. 7. What is the greatest difficulty you’ve had to overcome? I suggest answering this question the same way as the previous question. unhappy, he will tell you he quit. Whenever you hear, “It was mutual,” the person is really saying my employer was not happy with me and they let me down easy by allowing me to resign. Whenever I hear “It was mutual,” I think the person got fired and I am being lied to. The killer answer to this question sounds like this. “After a short time at ABC company I became concerned about my advancement opportunities and the stability of the company. I was recruited to go to work at XYZ company who gave me a deal I thought I couldn’t pass up. After I got to XYZ company it was clear I had made a mistake. I cannot make a mistake like that again and need to do better research before I make another move.” If you got fired it will sound like this. “I got fired. My manager’s style and mine did not mesh at all. I am not one to talk bad about an employer but it was difficult performing well working under an adversarial leader.” Remember be honest and keep it brief. 9. What are you looking for in a new job? Sounds pretty clear cut, doesn’t it? This question sounds like a great opportunity to tell the employer exactly what you are looking for in terms of duties you prefer or not, your long term goals, whether you want to travel or work less hours, and where you want to be in five years. This question is a trap. I often ask this question early in an interview after I get the interviewee comfortable. What I hear as an answer to this question tells me whether I have the type of job that the candidate is looking for or not and how picky or demanding the person is. I have probably eliminated more candidates based upon this question than any other. Be careful. My advice is to give fewer specifics and preferences than you think acceptable. The killer answer to this question is, “I am looking for a good company that I can grow with. I hope to find a leader and mentor who can use my talents and a job I can really sink my teeth into.” Leave it vague and open ended. Specifics can eliminate you. 10. Why should I hire you? This question is easily the one that is answered incorrectly the most often. It is only asked in about 40% of the interviews I have sat through, but it still warrants preparing an answer for. The question is most often asked toward the end of the interview after you have had a chance to talk about yourself and all your strengths. The incorrect answers that I most commonly hear are a repeat of the individual’s strengths. “I am hard working. I have the relevant experience. I have always been ranked as a top performer.” The interviewer has already heard these things. I believe the interviewer wants to hear what you can do for them. Instead of talking about you or repeating your strengths, tell the interviewer what you can do for him and his company. The killer answer to this question is, “I will make your department more successful. Your customers will be happier when I service them. I will help you achieve your goal of becoming the top company in your field.” Do you hear the difference? Your department, your customers, your goals. Not I, I, I.
cardinal rule is not to talk about salary unless you are asked. Asking how much the job pays before you are asked to talk about it is improper interview etiquette and will cost you. The killer answer to this question is, “Last year I made “$”, I am sure you will make a fair offer.” “I was hoping to make “$”, however it is not all about money, I am sure you will make a fair offer.” The danger is to give them too high a number, which could eliminate you, or to give them too low a number and leave money on the table. REMEMBER, COME PREPARED AND STAY ON YOUR TOES!